A simple Gite pasta and soup dinner left a hole in my stomach that I couldn’t really fill with breakfast consisting of homemade bread and jam offered by Gite’s hosts 🙂 We departed at around 10am to avoid the cold morning hours. Italian riders warned us that it is bitterly cold at the passes. The lady at the Gite was surprised that we asked for breakfast at 9 as most walkers/horse riders leave much earlier. We only had 10km ascent to the top from where it was 31km downhill. I wasn’t worried about the ascent as the effort keeps you warm, however, the descent promised to be chilly. The initial section of the climb to the pass is steep at 10%, it than flattens out to about 4% for 2km and after that the switchbacks start, averaging 8% (nowhere it was less than that). The air cooled down and the altitude made it hard to push up 8% slopes with a 40kg load. I had to make frequent stops. The surroundings were marvelous. 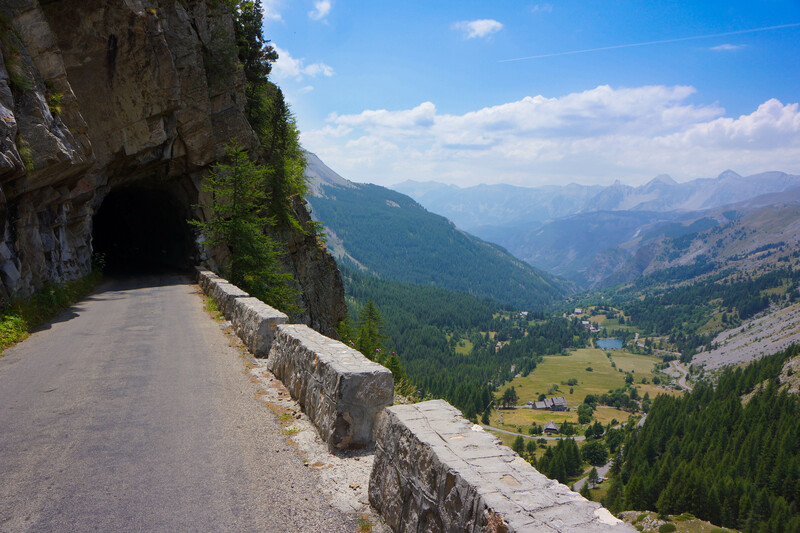 The road existed the pine forests onto an alpine meadow with waterfalls, streams and towering peaks of the alpes maritimes above us. I was moving so slow that the flies could catch up with me and that was becoming really annoying. We reached Refuge de Cayolle, 2200m in around an hour and a half. It was almost exactly a year ago when we stayed here with Dianna in Anna’s tummy 😉 Now she see what she missed. The weather is exactly the same, bitterly cold as a year ago! We change into warmer clothes and continue up the pass, summitting 15 minutes later. It was very cold and windy, we didn’t spend much time at the pass and started our descent towards Guillaumes. 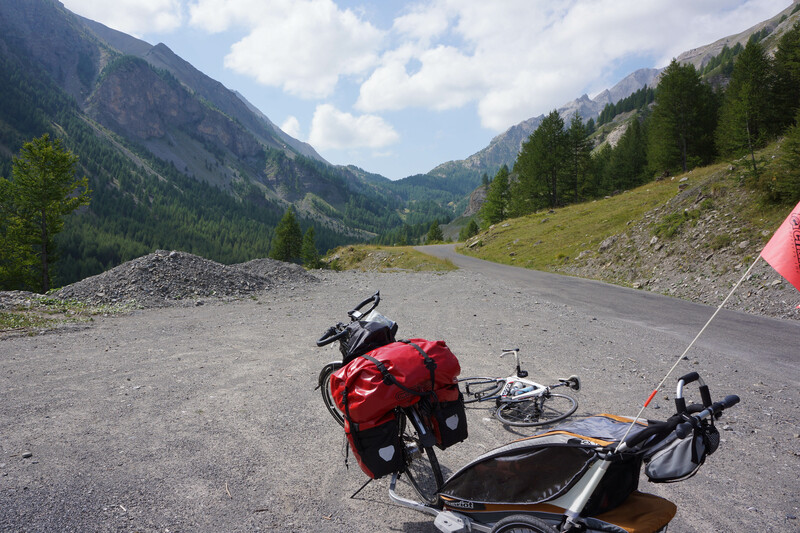 The road from Col Cayolle is basically downhill until the coast, 2300 meters of downhill. Without Dianna we could have tackled it in one day. However, the scenery en route is one of the best in the Alpes and we decided to take it slow. The descent was fast through and endless series of switchbacks bringing us to Estenc (1800 meters and considerably warmer) and than to Guillaumes (31C).